What do the characters on Arrow fight for? What gives them the strength to keep going? It’s telling that the show’s psychopaths have the clearest motivations. Slade Wilson and Isabel Rochev are the two characters furthest removed from their sanity, but they at least understand what propels them to do what they must do: pure, unreasoning hatred. It should be pointed out that there’s nothing ideological about their vendettas. Slade Wilson isn’t Malcolm Merlyn; he will never tie himself into rhetorical knots trying to convince a skeptic that the carnage he unleashes serves some larger purpose. Slade is fully aware of how disproportionate his vengeance is, as he happily tears down an entire city just to rob Oliver Queen of something he loves. After all, there’s only one person that this Slade might still feel he would need to justify himself to, and that person—Shado—now lives on as a twisted, psychotic perversion of who she once was; she who should be the voice of sanity has become the manifestation of his madness. Slade Wilson’s methods may encompass all of Starling City, but his ultimate aim remains so focused, and that’s the death of Oliver Queen. How can one ever defeat an enemy who destroys entire cities as a mere prelude to final battle? There are glimmers of hope in the early going of “Streets Of Fire.” Detective Lance—who is now actually a detective again, a moment whose poignancy is only slightly undercut by the fact that nobody ever stopped calling him “Detective” in the first place—takes down one Mirakuru warrior with three well-placed grenades. 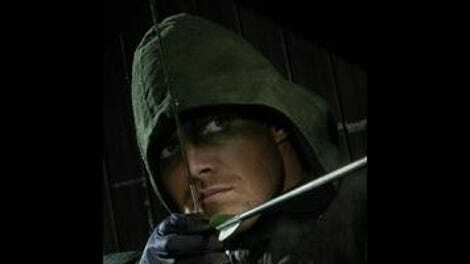 Malcolm Merlyn returns as the Dark Archer to save his daughter Thea, with Merlyn finding a particularly brutal way to reuse an arrow in taking down her assailant. The show just about manages to have Laurel fire an explosive arrow without totally undermining the idea that using a bow requires significant training. And, in what really has to count as the episode’s most rousing moment, Isabel’s big threatening monologue to Diggle, in which she discusses just how much she looks forward to killing Felicity Smoak, is interrupted mid-sentence when Felicity rams into her with the Arrow van. Taken together, these moments represent some masterful de-escalation. 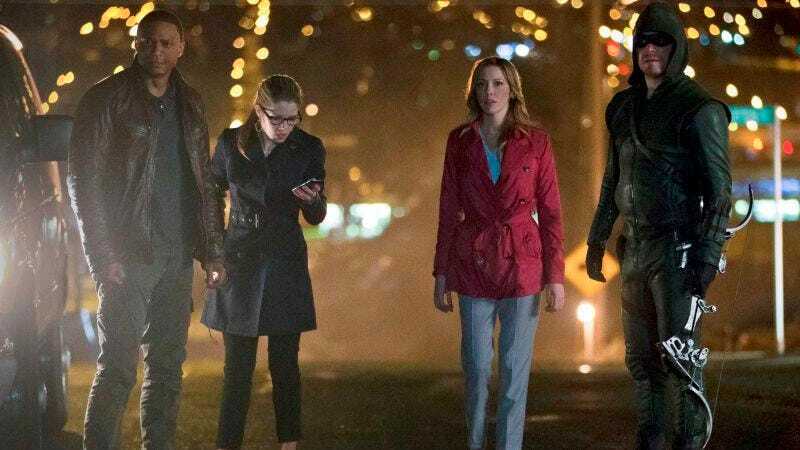 The show can’t possibly hope to keep building on the tension evident at the end of “City Of Blood” for another two episodes, nor can it have Team Arrow continue to endure nothing but defeat for another two hours. These small but decisive victories represent a quick reset, giving our heroes some hope as they prepare for their final assault on Slade Wilson and his Mirakuru army. If this episode has a coherent plot, it has to do with Oliver, Felicity, and Diggle’s attempt to recover the Mirakuru cure. At first glance, it can feel just a little underwhelming that the penultimate episode of the season is taken up with the search for a plot device, especially one that we haven’t seen before, that we don’t know whether it works, and that was made by characters whom we can’t see again because they’re busying preparing to costar on the Flash spin-off. Taken together, that’s an awful lot of abstraction to build such a crucial episode’s plot around; as great as “Streets Of Fire” is, it doesn’t quite find the show’s highest gear until it’s able to fully convey just how dire the stakes are. After all, Oliver and company had a plan to take down at least some of the Mirakuru warriors at the end of last week’s episode, but here, we learn that there are only two possible ways to defeat Slade’s army: the Mirakuru cure or Amanda Waller’s drone strike. Some of the fuzziness of this episode comes from how it has to balance the varying scales of its threats. Slade and Isabel’s rage remains so focused on particular people, and Oliver himself is convinced for the longest time that there’s still hopefully a way to end all this with just one more person’s death. About halfway through, tonight’s episode makes it absolutely clear that the larger attack must be reckoned with on its own terms. The story of Arrow’s second season is not about Oliver fighting Slade, but about Oliver saving Starling City once again. That brings us back to why the characters keep fighting. It’s hard for Arrow to bring this to the surface on a consistent basis, but “Streets Of Fire” does a particularly good job of demonstrating just how damaged all of the island survivors are. Oliver is easily the most balanced of the three, yet he’s still someone who lives his life based on lessons taught to him by Professor Ivo and the Mirakuru-addled Slade Wilson. His core morality is so shaped by his inability to shake the words of insane men who despised him. That’s why he keeps talking about how it was he—rather than the lunatic who actually fired the gun—who killed Shado, and, more subtly, it’s why he talks about all the people he tries to honor as though he has already failed them. This is where the importance of having good friends becomes so clear, as Felicity, even during her own darkest hour, never wavers in her belief that none of this is Oliver’s fault. And, by and large, she’s right: The blame for all of this either belongs entirely to Slade Wilson and his minions, or this is all the terrifying end result of that which Anthony Ivo attempted to unleash all those years ago. And yet, with just one episode to go, we still haven’t seen Oliver make his decision to kill Slade Wilson instead of cure him. Oliver’s true culpability may still be waiting to be revealed. Again, Oliver is the most balanced person to leave the island, with Sara slotting in as a distant second (albeit with Slade Wilson coming in as an infinitely more distant third). Her story is ever so slightly wonky, what with her apparently chance encounter with her sister and the rather stilted conversation with the officers at the precinct, in which they say they may not know much about the woman who saved the child in the burning building, but they know she’s a hero. This isn’t the most seamless storytelling that Arrow is capable of, but “Streets Of Blood” cuts to some more powerful truths about Sara in her conversations with Laurel. The elder Lance sister continues to get some of her best material of the season, as she refuses to let Sara yield before her despair. Laurel’s ignorance, so often an irritant throughout this season, now transforms into something more profound. No, she can’t possibly understand what Sara has gone through, and, for once, she isn’t pretending otherwise. But she firmly believes that she still knows who Sara is, because she knew who her sister once was. Sara has stared into the abyss for so long that she has no real sense of self left; she can only think of herself as the sum of her actions, and her time in the League of Assassins means that most of her actions are horrific, even irredeemable, to use her word. But Laurel remains convinced there is a good person at Sara’s core, and she can prove it through what she decides to do from now on. Rushing into that burning building is a damn good start. What makes “Streets Of Fire” more than a table-setting episode—beyond all the action, which is so routinely impressive that it’s easy to forget just how remarkable it is that the show manages this on a CW budget—lies in its handling of Mayor Sebastian Blood. A show just slightly less good than Arrow would likely let him run his course as the season’s tertiary villain, donning his mask one last time for a final confrontation with the Arrow. Another show, still not quite as good as this one, might allow Mayor Blood a complete turnaround from villain to hero, as he realizes the full madness of Slade Wilson’s plans and throws in his lot with the Arrow. But “Streets Of Blood,” to its immense credit, chooses the middle path. Sebastian Blood appears to redeem himself by stealing the Mirakuru cure and handing it over to Team Arrow, but he never stops being a madman. To Oliver’s palpable astonishment, Blood still believes he’s going to be mayor after all this, and he still believes that his vision for Starling City is sound. The deal he strikes with Oliver is fundamentally a political one, not a moral one. Oliver’s entirely unconcealed disgust with Blood’s latest machinations, as he tells the Mayor to do whatever he has to do, is the perfect way to conclude their relationship; Isabel’s subsequent appearance to kill of the mayor close off the Blood plotline nicely. In its own weird way, “Streets Of Fire” is a character piece, an attempt to portray both the chaos that engulfs Starling City and how its citizens respond to it. Not for the first time, Oliver and Sara come dangerously close to giving up, with both gaining great strength from Felicity and Laurel, respectively. And for Oliver, his last little bit of hesitation evaporates once he learns what his true options are. Either he defeats Slade Wilson and the entire Mirakuru army by dawn, or Amanda Waller will level the city. Maybe Oliver is right: maybe, on some level, he has failed this city. But he’s got one hell of an opportunity to redeem himself next week. Whenever you need a slightly rambling, slightly incoherent, but nonetheless inspiring speech delivered in a crazy cop accent, look no further than Paul Blackthorne. I understood maybe half of the words in Detective Lance’s big speech about how this episode’s fight isn’t about laws but about helping people. That didn’t make the overall effect any less impressive. I already mentioned Malcolm Merlyn once or twice, but I rather danced around the fact that this episode marks his big return. John Barrowman is in fine form as the show’s Dark Archer, taking down a Mirakuru warrior with relative ease. It’s interesting to see that he’s just as insane and just as committed to the righteousness of the Undertaking as he ever was, but he still believes he can reach his deeply estranged daughter. I’ll have more about this plotline in next week’s episode, but I’m hesitant to talk too much about it until we know just what happens after Thea fires those two shots. Either way, I’m impressed both by the fact that Thea could actually bring herself to fire the trigger… and that Malcolm would so calmly tell her to take the safety off first.